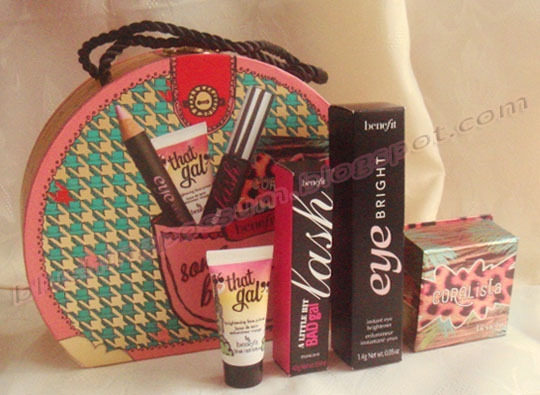 A limited-edition set of four Benefit "lust-haves" in a collectible, purse-shaped box. 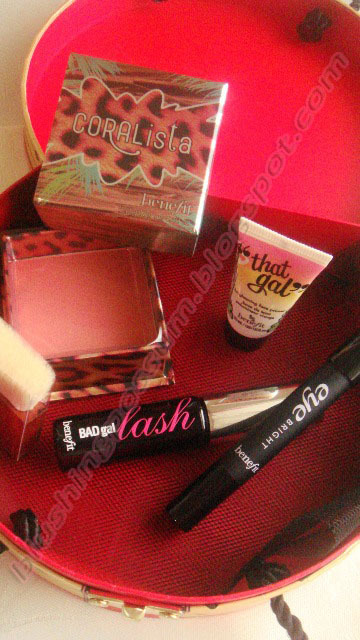 This kit is the perfect gift for the beauty obsessed and includes an array of face-brightening products including: one full-size Coralista coral-pink cheek powder, one full-size Eye Bright instant eye brightener, and deluxe minis of "That Gal" brightening face primer and BADgal Lash mascara. I was thrilled to check out the cute, vintage looking cardboard purse that’s holding all these “lust-haves” together. It also has a golden clasp and a couple of silky black, rope-like handles. It's durable but not durable enough to carry any other stuff besides make up but it makes a good decoration on any girl's top drawer. Inside the box was a different story. I was surprised to see that it doesn't have any bubble wrap or foam of some sort to keep all the products in place. Instead, it only has a black tulle net that's not doing anything at all. I immediately reached out for the Coralista blush to check if it got broken! I’ll be devastated if it was for it’s the reason why I bought this set in the first place. I want to know if it’s really worth the hype it gets.